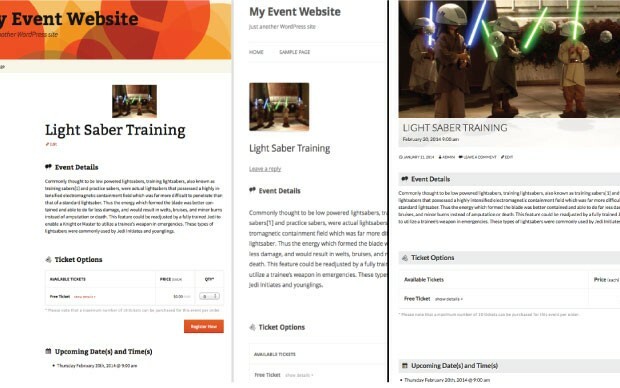 Integrate Event Espresso into your theme and reuse attendee data as you would other post data. Event CPT data includes normal post data including: Title, Description, Tags, Categories, Featured Image, Commenting, Excerpt, Custom Fields, Slug, Author, etc. This data can be queried and displayed in themes as with other post data. See Customizable Event Designs. For security reasons, Contacts are private CPTs that can be enabled in the front-end (by modifying PHP templates). As with other custom post types, Event Espresso is packaged with default event archives, single event pages, venue archives, and single venue page templates. You can copy these templates to your theme folder so that the Event Espresso pages inherit your theme’s post page layouts and styles. See Customizable Event Designs. We know you can’t always build and publish an event at once. Event Espresso 4 will allow you to save events as “draft” status so that you can save your progress and return later to edit and publish your event. WordPress enables you to schedule when posts and pages are published. That functionality extends into Event Espresso’s CPT pages so you can announce your event at just the right moment. One event can be published for many dates and times (datetimes), so you can leave an event published for a long time, or even reuse the event page many times. You don’t have to create all new event pages for each date. See Multiple Dates and Times Per Event. Because all your Event Espresso Events, Venues and Contacts are CPTs, they integrate with custom post type plugins such as: Custom Post Type UI, TinyMCE Advanced, Advanced Custom Fields, etc. Be selective about who can register for your events. Wouldn’t it be amazing if the event pages of your website performed better organically in the major search engines? Our Event Schema Markup, using Schema.org Structured Data feature may help. Use hooks to make safe and reliable customizations.